The Statue of Liberty is a famous statue honoring the friendship between France and the United States of America found on Liberty Island, New York City. It is one of the three landmarks in the city that Koopa Troopas stole artifacts from during the events of the game Mario is Missing!. Luigi's task is to find the Statue of Liberty Torch, which symbolizes enlightenment, and deliver it back to the statue. Upon success, he is rewarded 1,750 dollars plus a bonus prize of 2,500 dollars. It made its appearance at the end of Recycled Koopa in The Adventures of Super Mario Bros. 3. The Statue of Liberty was a gift from the French people to commemorate the friendship between the countries which started during the American Revolution. Built by Franco-Italian sculptor Frederic Bartholdi, Ms. Liberty was dedicated on October 28, 1886. Made from copper, the statue weighs 225 tons and stands 151 feet tall. Her nose alone is four feet long. The torch in her right hand is raised above the Hudson River. Her left hand holds the Declaration of Independence. The statue stands on Liberty Island in the New York Harbor. In Mario Kart 8, Toad Harbor has a statue that is very similar to the Statue of Liberty, though sculpted to look like Princess Peach. 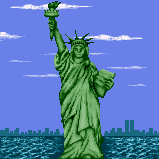 If one looks closely, the Twin Towers can be seen on the bottom right of the image showing the Statue of Liberty from Mario is Missing. This page was last edited on March 29, 2018, at 18:38.